Right next to the Torrens here. Buttered ham hock cabbage, pickled quince and chestnut vinaigrette. 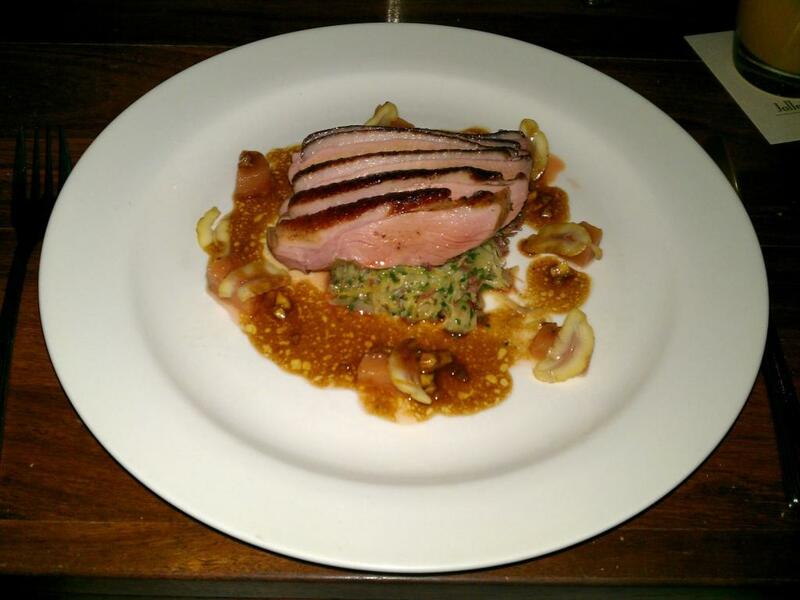 The duck was lightly cooked, but very soft and flavourful, while still retaining a slight meaty texture. The pickled quince and chestnut vinaigrette gave q tang to the meat, but the bed of cabbage was a bit mild. It also contained some ham. I’m no expert on feeding, but I don’t think meat is a good topping for other meat. I couldn’t work out what the cabbage/ham base was about, but it was mild enouh to ignore. According to the waitress, they did not just go out and grab a duck from the river and serve it. It never hurts to ask these things, however. Three different desserts. Let’s see if it matches up to the five desserts of Faraja a few days ago. 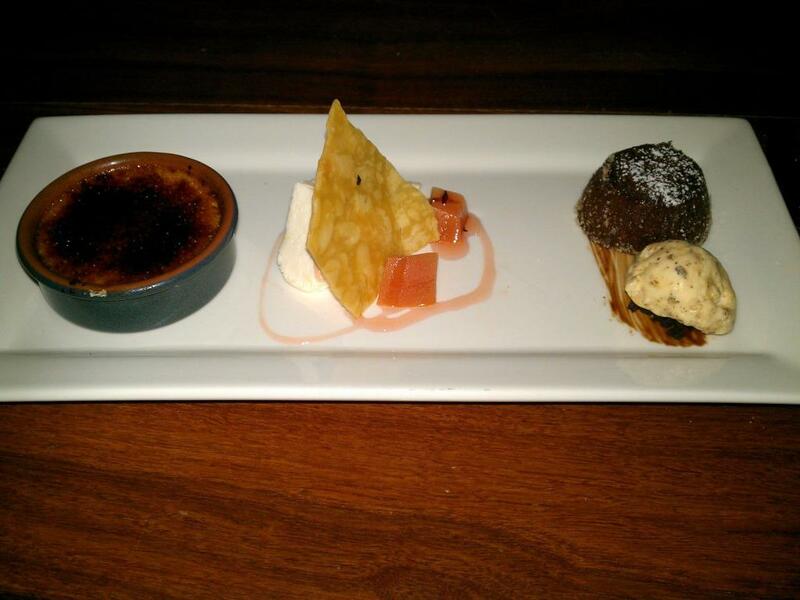 From left to right: The vanilla creme brulee had that toasted marshmallow taste, but the custard was slightly ordinary and runny. Still good though. The terrine is like frozen tangy cheesecake, which is nice in a small dose. The accompanying cubes of fruit are much more interesting. They have an almost lolly-like taste. I think they’re guava, but the sweet fruit plus aniseed has a very peculiarly sweet taste. Edit: it’s quince. The fondant is floury and a bit gluggy. The bizarre ice cream with it is like a caramel flavour, but it contained something that wasn’t itself uniform, like an almond brittle or something.